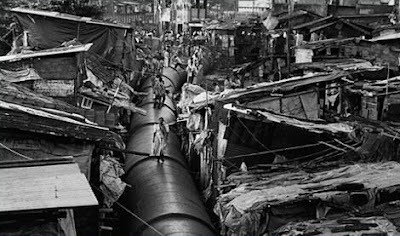 There is much that is admirable in the way that slum dwellers struggle against overwhelming adversity, but admiration must be tempered by the realization that they do not struggle because they choose to, out of principle, or in the service of high social or political ideals, but because of their desperation at the brutal limits of survival. It is a mistake—and a grave disservice to them—to imagine that their ingenuity, resourcefulness, and capacities for self-organization can in any way serve as models for our present global society. To believe so would be to endorse the dog-eat-dog ethics that rule their lives and, all too often, those occupying society’s more economically advantaged classes. This is such a good reminder and an interesting quote in light of a previous post of mine on Squatter Mimicry, and the idea that the innovation from within the “slum" (regardless of whatever has motivated it) may one day serve as an ironic – albeit informal – model for some sort of spatial practice as the developed world begins to implode under the weight of its own continual uneven urban development. Who knows, we may soon all find ourselves facing more and more conditions similar to the "slums" if the global economy is not retooled in favor of strengthening a global middle class, at which point our own children may be forced themselves into slum-like survivalism emerging from the heart of the developed world. I am not saying 'slum innovation' is a counter or caveat to the present inequality of global society, or represents anything thing corrective, but rather might offer a glimpse of a tactic potentially usable to us all as we continue to polarize the world. In this sense, the squatters are the pioneers for our future if it continues in this direction, not necessarily the optimal means for recalibrating the disparities of the global economy today. I hope that makes sense and my distinction is clear. "The best plans generally let the slum dwellers themselves make the main decisions in planning their future. You should provide clean water, toilets, electricity, garbage collection and disposal, and maybe let people build their own houses if they can using materials that you can provide," says Aprodicio Laquian, the Filipino-Canadian planner who practically invented the idea of slum-dweller-designed urban rehabilitation in the 1960s and is now at the University of British Columbia. "Eventually," Mr. Laquian says, "you want to make available a better sort of housing, a five-storey walk-up apartment, but planned according to the needs of the community, not by some central plan." How to address these conditions? Who should lead, though what sorts of planning, for whose ultimate benefit? Can models in one context be successfully reproduced in another, or does each place need to devise its own community panning? Anyway, just more for the cauldron. On my visit to that country it is clear that shack settlements are home to both deeply authoritarian and often violent top down party politics and a bottom up liberatory militancy. In some ways that militancy, for instance in its instance on holding land in common and rent free, is leading other struggles. But shack dweller militants certainly do not claim to be some kind of avatar of the future. They merely insist on the recognition of their humanity and wish to dialogue with other struggles on that basis.